geological maps and field measurements. by the form of digital or analogous thematic maps . codes from the side of the end-user. in a more sophisticated manner. 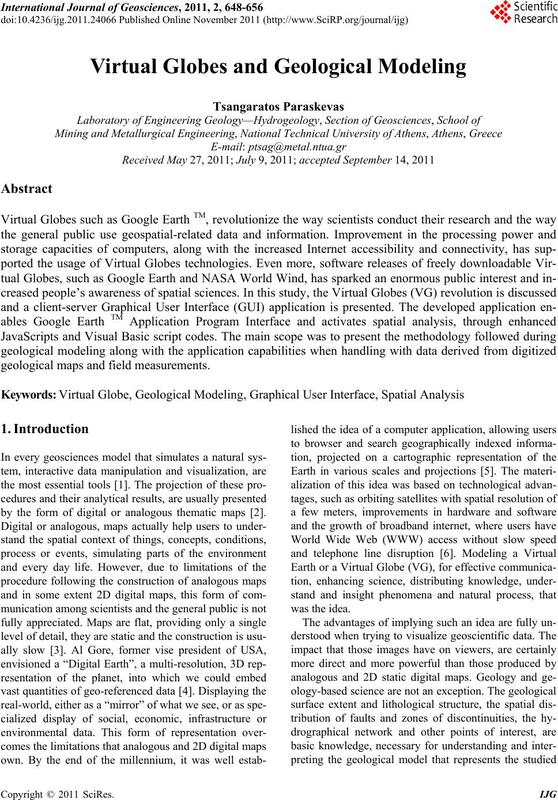 geospatial data on the internet using the relative servers. piled, adding new functionality to the programs. geophysical hydrodynamic models was presented by . 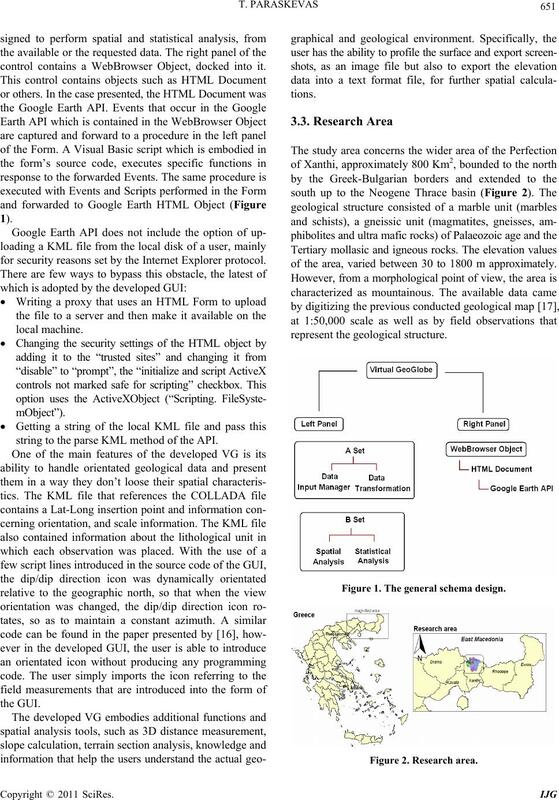 Firstly, users draw p olygons on the Goog le Earth screen. field was also included as a supplementary example. All of those procedures share the same characteristic. data input and visuali zat i on. and in any place, though VG technology. though the advantage of accessibility via the WWW. in interactive and dynamic interfaces on web pages. 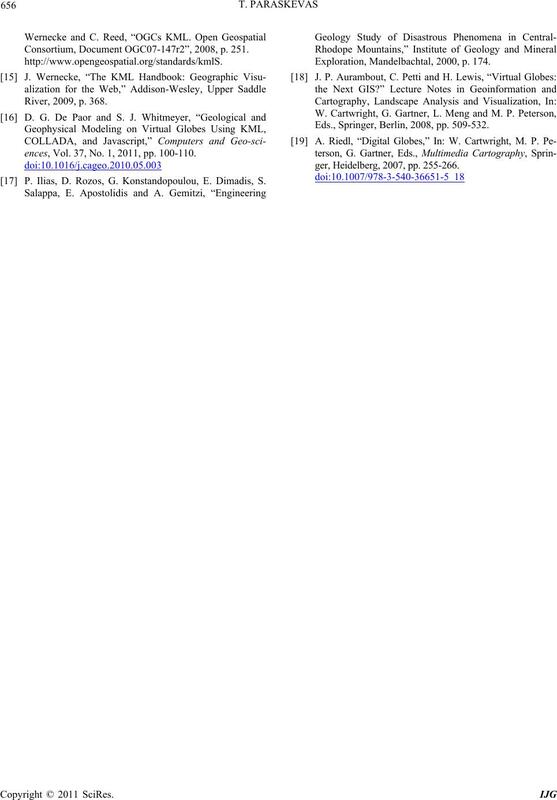 browser window, it requests a page from a Web server. the program loads and displays data as needed. nary values, images, Sketchup models, etc. with a “.dae” (digital asset exchange) filename extension. reformed and saved in a KML format. control contains a WebBrowser Object, docked into it. for security reasons set by the Internet Explorer protocol. string to the parse KML method of the API. of the area, varied between 30 to 1800 m approximately. Figure 1. The general schema design. be true north, grid north or magnetic north. and is characterized by a positive angle between 0˚ - 90˚. when the user choose to change the view angle. even when the user changes the view angle (Figure 6). Figure 3. Geological layer overlapping 3D terrain data. Figure 4. Fault layer overlapping 3D terrain data. slope calculation and produce elevation profile (Fi gure 7). 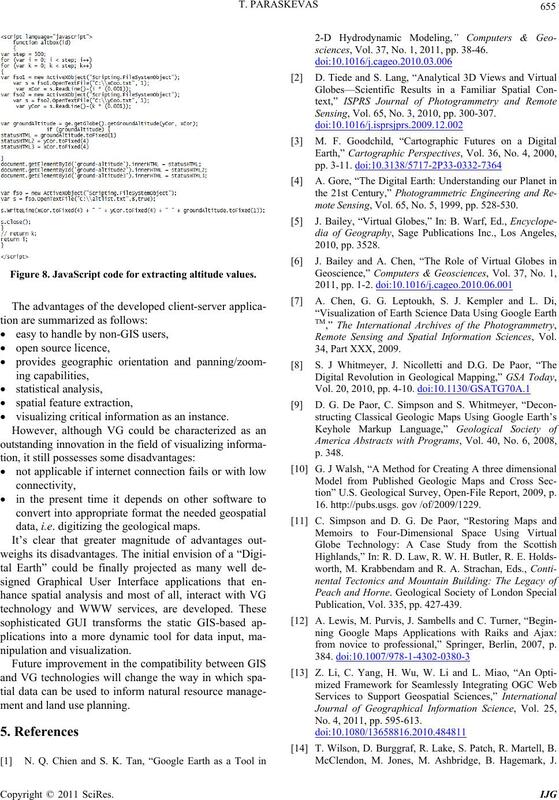 for each geological layer introduced by the KML file. 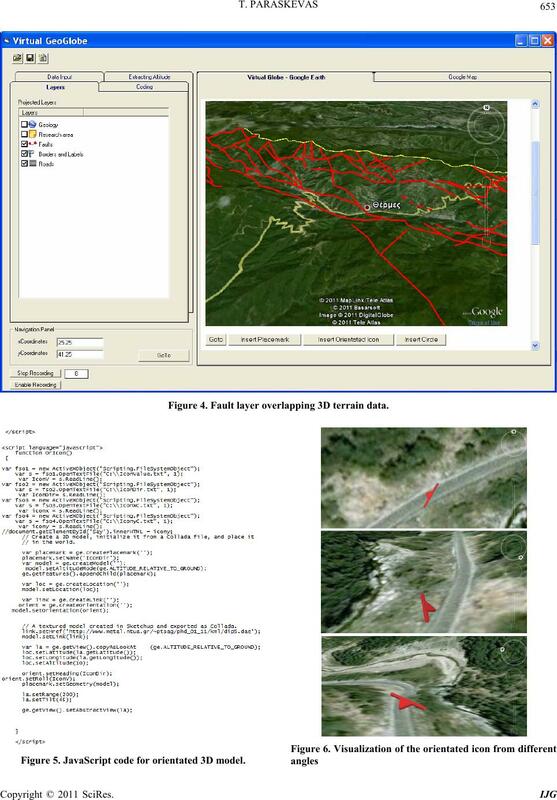 different type of spatial data. integrate multiple data layers onto one interactive interface.  visualizing critical information as an instance. data, i.e. digitizing the geological maps. nipulation an d vi sual i zat i on. ment and land use planning. sciences, Vol. 37, No. 1, 2011, pp. 38-46. Sensing, Vol. 65, No. 3, 2010, pp. 300-307.
mo t e S ensing, Vol. 65, No. 5, 1999, pp. 528-530. 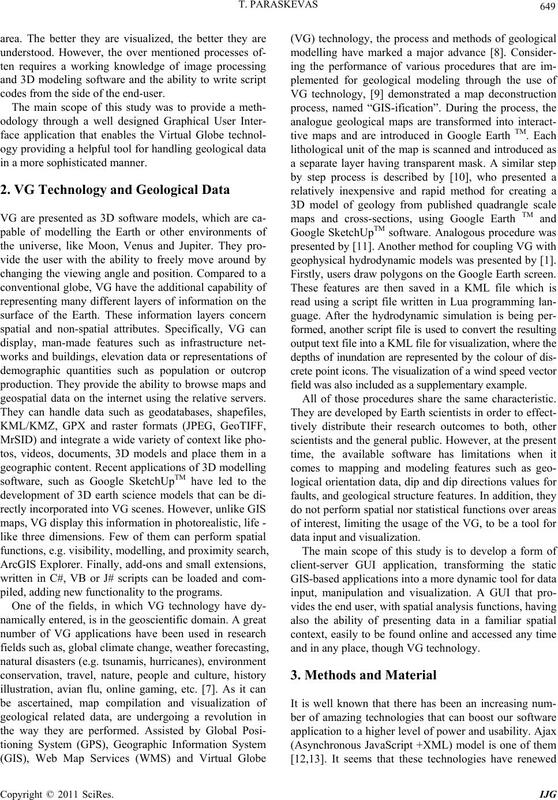 Remote Sensing and Spatial Information Sciences, Vol. 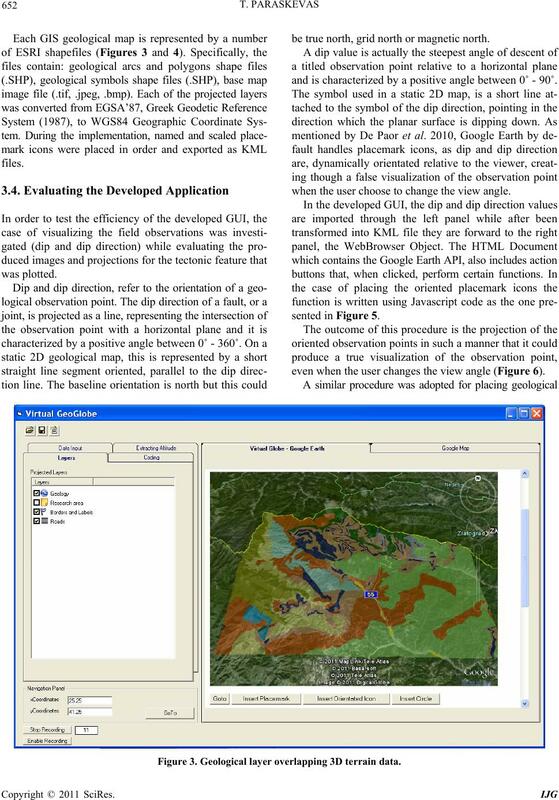 tion” U.S. Geological Survey, Open-File Report, 2009, p.
Publication, Vol. 335, pp. 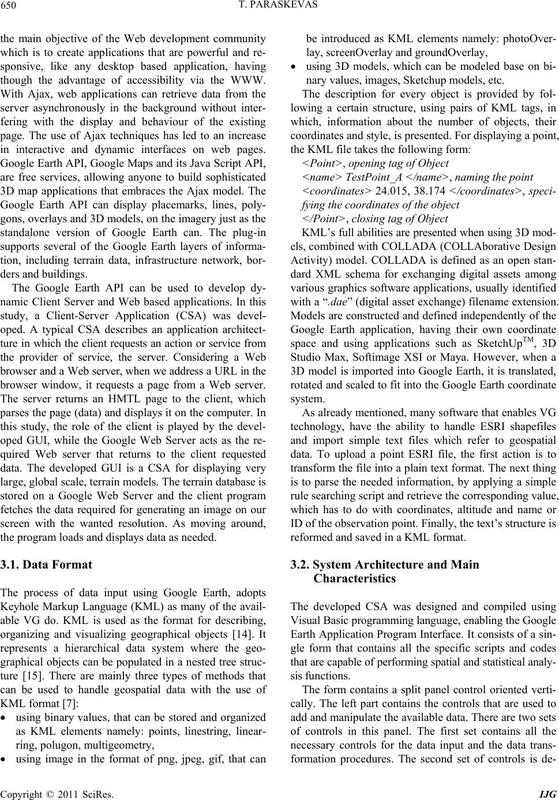 427-439.
from novice to professional,” Springer, Berlin, 2007, p.
No. 4, 2011, pp. 595-613. T. Wilson, D. Burggraf, R. Lake, S. Patch, R. Martell, B.
McClendon, M. Jones, M. Ashbridge, B. Hagemark, J. 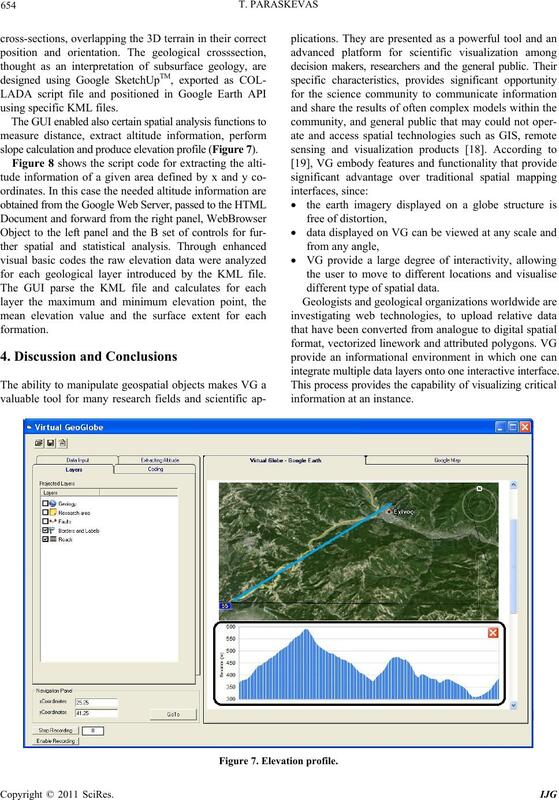 Consortium, Document OGC07-147r2”, 2008, p. 251.
ences, Vol. 37, No. 1, 2011, pp. 100-110. P. Ilias, D. Rozos, G. Konstandopoulou, E. Dimadis, S.
Exploration, Mandelbachtal, 2000, p. 174. Eds., Springer, Berlin, 2008, pp. 509-532.
ger, Heidelberg, 2007, pp. 255-266.